We are proud to announce that Violet J Spa in San Jose, California, won the prestigious Book Local Community Choice Award 2016. 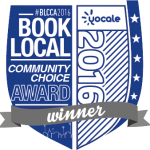 The Book Local Community Choice Award by Yocale selects the providers of best customer service based on reviews and engagement in the community. We would like to use this opportunity to thank all our loyal clients who have been coming to Violet J Spa over the years. Violet Johnson, PhD is a licensed cosmetologist and esthetician specialised in permanent make up. Violet is a former British nurse midwife who worked internationally in Saudi Arabia for 8 years. She knows about skin from the inside out, she is a trained public speaker and she is an expert on how spa visits affect your health in a positive way. She is an aromatherapist trained with Eve Taylor of London specialised in multiethnic, mixed skin. Violet is a trained hypnotherapist and health practitioner.